JAMES D. BRIDE graduated from St. Francis College in Loretto, Pennsylvania in 1964 and Seton Hall Law School in 1968. He was a special education teacher in Newark before joining Allstate Insurance Company where he tried cases on a daily basis for twelve years in Union and Morris Counties. After joining our firm, Mr. Bride has continued in the same capacity, now having over forty years of trial experience. He has had substantial exposure to commercial and professional liability claims, including those involving manufacturers of products, real estate professionals, nurses and psychologists, as well as motor vehicle, and personal injury protection disputes. He also has represented defendants in employment discrimination and sexual molestation cases. Mr. Bride is admitted to practice before the state and federal courts in New Jersey and has been Certified by the Supreme Court of New Jersey as a Civil Trial Attorney. He is the former Chair of the District X Ethics Committee, presides as a Municipal Court Judge in Long Hill Township, New Jersey, and has been named as a “Super Lawyer” in New Jersey Monthly Magazine. 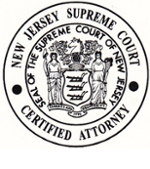 In addition, Mr. Bride lectures periodically for the Institute of Continuing Legal Education and is a member of the New Jersey State Bar Association.